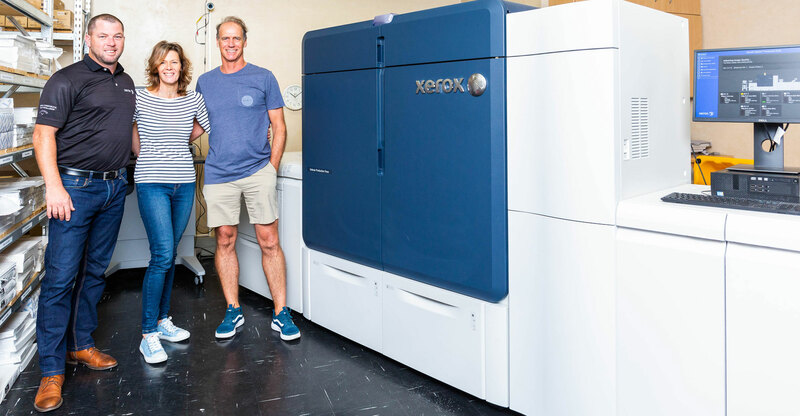 Cape Town’s premier high-street digital print and design specialist, Hot Ink, has brought the “wow” factor to digital printing in Cape Town with the city’s first Xerox Iridesse production press from Altron Bytes Document Solutions (BDS). Hot Ink is renowned for providing the highest quality digital printing and design services in Cape Town’s competitive corporate CBD market, and is the go-to studio for many of the city’s designers, artists, advertisers and smaller print shops. The newly released Xerox Iridesse, which replaces the company’s previous Xerox flagship, the Xerox Color 1000 Press, raises the bar once again, giving Hot Ink’s clientele an extra level of quality and versatility. Sporting an improved ultra-high-definition engine with a combination of 1200 x 1200 dpi x 10 bit RIP rendering and 2400 x 2400 dpi x 1 bit print imaging, the Iridesse also includes Xerox’s all-new low-gloss, small-particle High Definition Emulsion Aggregate (HD EA) toner, xerographic design advantages and automatic IQ corrections that work together to create brilliant results for text, fine graphic details, tints, solids and photographs. “This is a design-based business with printing as a service,” says BDS production press specialist Bryn Whithair. From a business perspective, Hot Ink likes to keep the numbers confidential, but Saville says that since the Iridesse was installed, volumes have increased along with gross profits, “so it makes perfect business sense”. Visit www.bdsol.co.za for market leading products that will give your clients a competitive edge.